A traditional Korean cabbage dish, kimchi has numerous variations and this is one of the simplest. The mixture of spices in kimchi can help the body fend off bacterial and viral infections. The spices also have a strengthening effect on the circulation and digestion. Since kimchi uses cabbage as its base, it also contains a range of cancer-fighting nutrients. Makes 450–600g (approx 1 lb 5 oz). 1 Cut the head of the Chinese leaves lengthways into quarters, then into 5cm (2in) chunks. Place in a colander over a bowl. Add the sea salt, toss well, and leave to stand overnight at room temperature. 2 Wash the Chinese leaves thoroughly to remove the salt, tossing them with your hands to rinse thoroughly. Drain and dry on kitchen paper. 3 Transfer to a freezerproof container (large enough to hold up to 600g/1lb 5oz of Chinese leaves) with a lid. Add the remaining ingredients and toss together thoroughly. 4 Place the lid on the container, leave at room temperature overnight to marinate, then allow the flavours to develop in the refrigerator for a few more days. Store in the refrigerator and use within 2 weeks. So how do you eat Kimchi? 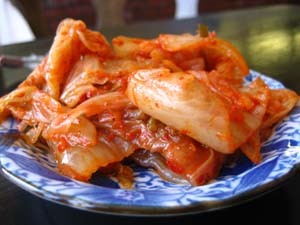 Kimchi can be eaten on its own or stirred into rice or noodles as a side dish. Try spicing up your chicken or tomato soup of by tossing a bit in or us as a filling in an omelette. Use as a pickle in sandwiches or with cheese or liven up a fresh vegetable juice by thoroughly blending in a spoonful. See other recipes from the book: Warm Chicken Congee, Quinoa and Vegetable Stack, Astragalus and Schisandra Broth and Blackberry and Elderberry Crumble.